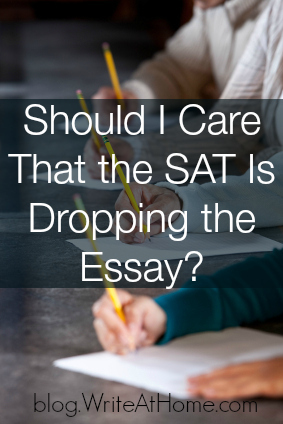 Home / Blog / Should I Care That the SAT Is Dropping the Essay? You’ve probably heard the news. The SAT announced recently that, as of early 2016, they will be dropping the required essay. There are other changes they are making too — they will try to make vocabulary more relevant, and they will no longer deduct points for incorrect answers. All of these changes raise questions, but I want to focus on the essay decision here. As a guy who spent a lot of time developing a curriculum and an online course to help students prepare for the essay, I’m a bit disappointed from a personal perspective. But I’m not surprised by the decision and I’m not concerned about it generally. There are problems with the essay portion of the SAT. In particular, I’ve objected to forcing students to demonstrate their writing ability in just twenty-five anxiety-packed minutes. That’s just not fair. For decades, we’ve been teaching students that writing is a process involving pre-writing, drafting, revising, and proofreading. Now we’re telling them to forget all that and crank out something brilliant, persuasive, erudite, creative, and grammatically correct in less than half an hour. There was no way around this, of course. The test was already crazy long when they added the writing component. You can’t reasonably expect a student to take a five-hour test. But twenty-five minutes just isn’t enough time. Lots of people criticized the scoring of the essay, but I never minded it much. I think the College Board did the best they could to keep it human (no computer scoring at least), and build into the process some checks and balances to keep scorers from getting too sloppy. Still, readers had very little time to read and assess papers. I understand the average was about three minutes. And studies of results have raised concerns. I also think that writing ability is a strong indicator of college success, which is what the SAT purports to assess. It’s just that an essay has too many drawbacks. The reason the SAT killed the essay, by the way, was because colleges never bought into it. A large number of institutions, even eight years after the writing section was introduced, still look at only the math and reading scores. Another factor was the constant criticism, including studies that showed that long papers with fancy words (even if they were misused) were likely to score high even if they were poorly written. Les Perelman, a writing professor at MIT, was one of the earliest and loudest critics of the essay. In the end, his efforts were rewarded. For those with a writing talent that they hope can get them noticed by colleges, it will still be possible to include the essay. It will be part of an additional test of some kind. Something like the SAT II, I suppose. More information will be forthcoming. I’ve already heard many voices complaining that this is another indication of the dumbing down of American education, but I wouldn’t go that far. At least not when it comes to the elimination of the essay. The College Board isn’t dumbing the test down, it’s returning it to the way it was for eighty of the test’s eighty-eight years. None of us parents ever had to take the SAT essay, so we can save all of our “In my day I had to walk to school…” speeches. They tried it, and it didn’t work very well, so they are scrapping it. That sounds like wisdom to me. So, no, you shouldn’t be concerned about the dropped essay. The vocabulary and scoring changes maybe, but not the ex-essay. That, I think, should be applauded. Just be aware that unless you are in 9th grade or younger, this news won’t affect you. The SAT is still unchanged through 2015. And that means you still have reason to take my WriteAtHome SAT Essay Prep workshop! Please leave a comment. I bet it won’t even take you twenty-five minutes. Excellent balance, Brian! Certainly the SAT essay’s limitations are reason enough to not weep too long or too loudly because of its future demise. In my experience, the single best value to the SAT essay is measuring a student’s ability to write under pressure.